Connecting as a family during the holidays. Of the 83.5 million households in America, close to 70 percent of them are stepfamilies. 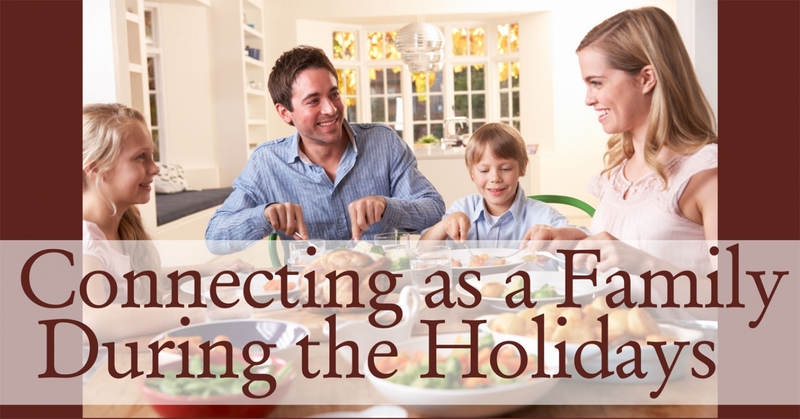 Whether you are a step or biologically connected family, the holidays are the perfect time to develop your family rituals so that traditions are remembered by all participants with fondness. More importantly, children learn from family rituals. Remember that parents are the core of the house. Parents are the pillars that hold up a family. If the couple— or the single parent— is weak, so is the family structure. Among an entire family, discussion, compromise and agreement are crucial. Eight other pointers follow to ensure the holidays go smoothly. Schedule even the smallest of holiday gatherings. Family get-togethers can take place at home or at a relative’s house that’s a plane ride away. The larger the holiday, the more planning it takes. Start planning and discussing Christmas, Hanukkah and Kwanzaa weeks before the holidays arrive. Consider procedures for arrivals, expected behaviors, dress concerns, manners, chores, seating at dinner and departure times. Go over plans with the other parent (or ex-spouse), stepparent and grandparents, as needed. Set a precedent now. This allows for a smooth future. Plan each holiday as if you were the director of a movie. Apply the five Ws: who, what, where, when and why. Take all contingencies into account. 2. Maintain that the family meal is the altar of the family. The family meal is an ideal setting for teaching values, ethics and a vision of self and the world. These meals, eaten together, should occur at least three to four times a week. TV, phone calls and bad manners are excluded from the family table. The dinner table should be a place where everyone is free to voice opinions about family issues and make decisions about family plans. And the dinner hour doesn’t have to be solely devoted to family concerns. You can talk about what you’ve read in the paper or seen on television. Literature, new movies, politics— all these things can and should be discussed at your family altar, the dinner table. The reasons for having open discussions at family meals are significant. It’s not simply a matter of sharing opinions. Conversations like this, and how they arise, maintain a family’s identity and philosophy. What you believe— about religion, the president, taxes, the environment, art, music and literature— shape what and how your children think forever. And if your children lack the opportunity to talk openly with you, free from the competitive noise of a television set and interrupting telephone calls, you are putting your most vital parental legacy at risk: your world view. It is something only you can communicate to your children, and, again, family meals provide the ideal setting. 3. Honor each others' differences. Often parents are familiar with different customs and religious backgrounds. Talk with your kids about the different religious and your cultural history. Parents should explain the meaning and importance of each person’s point of view. 4. For those in a divorce and step situation, realize that movement between homes is a part of life, especially during the holidays. If this is your situation, let your children know that the good news about a holiday is that your kids get to celebrate with more people in their life, though it may seem like they get less time to spend with their core family. Holidays typically represent a time for forgiveness and new beginnings, namely for divorced and stepfamilies. Ex-spouses must be civil— during the holidays and regular days— speaking and acting respectfully to each other for the well-being of the children. 5. Decide how to spend time, energy and money. Parents should clearly define the amount of time, energy and money that should be devoted to the holiday season. Contemplate time, for example. The day after Thanksgiving, Sarah’s father needs to get some work done at the office. Sarah’s stepmother has the day off. The father may expect his new wife to take care of his child, but an agreement needs to be reached first for this to work. 6. For families with visiting children, consider making a ritual around the arrival of the children. A predictable gathering in the living room, or collectively enjoying milk and cookies after the children have put away their bags, makes children feel confident and secure in a home. Talk to children about the activities planned for your time together. A ritual arrival time diminishes the uncertainty of not having been with each other for a while and fosters a welcomed procedure for visitation. 7. Get close and create a loving atmosphere. Bake pies and cookies, or share eggnog and popcorn by the fire. Do not let the TV be the only warm glow in the room. 8. Keep your sense of humor and relish the spirit of the holidays. Remember, you can create what you envision for your family.